I am running BAT Angels High with the latest service pack and I just started running it on my new pc. Everything seems to work fine until I get into a mission. I tried the stock Pearl Harbor mission (the one where you start at Bellows Field) and as soon as the cockpit loaded there was terrible lag. About 1 FPS at best. Then I created a mission in FMB. I used the Flight Test Center map and used a Spitfire Mk. 9 and four Bf-109G-4's to make a test mission. FPS was as high as could be. There is also no lag in the out-of-mission GIU. And I know it isn't my hardware because of the previous test and the fact that my fans don't speed up on my CPU cooler or my GPU. At first, I ran the game on Maximum Settings under the Video tab, and when the lag started I changed it to Safe. Same results. [-] 'GL_EXT_paletted_texture' extension - Palettized textures (8 bit RGBA palette). [-] 'GL_EXT_compiled_vertex_array' extension - Compiled Vertex arrays. [-] 'GL_EXT_clip_volume_hint' extension - Frustum clipping optimization. [x] 'GL_EXT_secondary_color' extension - Secondary Color for 3D fog & specular optimization. [x] 'GL_EXT_separate_specular_color' extension - SeparateSpecular for 3D fog & specular optimization. [x] 'GL_ARB_multitexture' extension - Multitexturing. [x] 'GL_EXT_texture_env_combine' extension - Multitextures advanced combining for special effects. [-] 'GL_NV_texture_env_combine4' extension - Multitextures advanced combining for special effects. [x] 'GL_EXT_texture_env_dot3' extension - Dot3 Bump advanced combining. [x] 'GL_EXT_texture_filter_anisotropic' extension - Anisotropic texture filtering. Playback format is set : sampling rate = 44100, num channels = 2. Buffer caps : Transfer rate = 0, CPU overhead = 0. Default speaker config is : 1310724. Temperature - 0m = 20.0 . Temperature - 1000m = 13.51001 . Temperature - 2000m = 7.019989 . Temperature - 3000m = 0.5299988 . Temperature - 4000m = -5.9599915 . Temperature - 5000m = -12.450012 . Temperature - 6000m = -18.940002 . Temperature - 7000m = -25.429993 . Temperature - 8000m = -31.919998 . Temperature - 9000m = -38.410004 . Temperature - 10000m = -44.899994 . Temperature - 11000m = -51.39 . Temperature - 12000m = -56.5 . WARNING: TRenderManager::TriangleList_ProjectiveShadow()- internal buffer overflow. Too many vertexes or faces per shadow hier mesh! As far as I remember, it's better to ignore Il2 setup application completely and instead to fine tune your game settings directly in conf.ini. 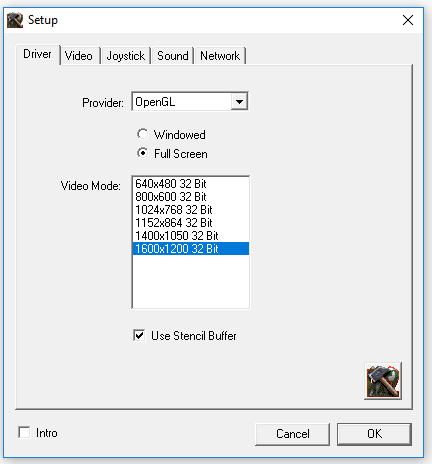 And in Nvidia Settings (if Nvidia is used). I'd also set Forest, Landgeom to 3 and Water to 2 for best visuals. Do you have installed the fixes for Angels High? Furthermore you should update to 3.5 Musketeer, as many issues are corrected by simply doing that. Otherwise the next issue will appear soon in your installation. For sure! You'll gain more and better content, many fixes and won't loose anything. And last but not least support from the moderators. Don't waste your time riding a dead horse.